Did you know that your feline fur-riend sleeps at least twice as much as you do? Cats sleep an average of fifteen hours a day, and older cats as much as twenty hours - about two thirds of their lifetime are spent snoozing! Which raises the question: why do cats sleep so much? This means that their most active periods are during the twilight hours of dawn and dusk. For many cat owners, the sleep cycle of their feline companions doesn’t make any sense -they spend the entire day resting and suddenly go mad throughout the night. Cats tend to lay low in the day-time and the darker night-time hours, when other predators may be around. This is because in an outdoor setting, the type of prey your cat would hunt would be more active during those twilight hours. However, cats are also sociable, highly adaptable, and very accommodating. They adjust their sleeping habits to fit around their feeding schedules, which is why an indoor cat sleeps more than a cat that roams outdoors – but most importantly, they learn to adapt to our schedules, so they can spend more time with their loved ones! Our feline friends have the physiology of a predator, meaning that they are hardwired to give chase and hunt - mainly at night. In the wild, cats must hunt in order to eat, and the stalking, chasing, and killing of prey burns a lot of energy. House cats still retain this wild streak, even though they have been domesticated - even cats at play will display the feline primal instincts of creeping about in the shadows, quickly going into stealth mode and pouncing on their prey. Hunting takes a remarkable amount of energy, requiring short yet very intensive and energy-consuming bursts, therefore sleep is necessary to conserve energy. Whether your kitty is hunting for prey or tackling a toy, all that rest they get is reserve energy for running, climbing, pouncing, and stalking. Cats’ behaviour can vary significantly, depending on their temperament, age, breed, and overall health, but it should come as no surprise that they are just as affected by the weather as we are. 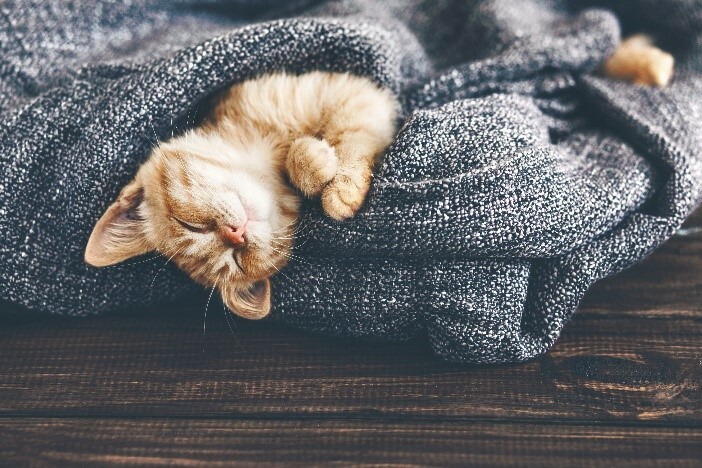 Whatever your feline’s usual disposition, it has been observed that cats sleep more when the weather calls for it - even if your kitty is an indoor-dweller, a cold or rainy day will have them curled up in their favourite spot. When cats are cold they have a tendency to sleep in a curled-up position and when the temperature is warm, they may sleep more stretched out. Just like people, cats are known to be able to doze in a simple catnap or to fall into a very deep sleep. About three quarters of the time your kitty spends sleeping is what we might call snoozing – this phase usually lasts for fifteen minutes to no more than half an hour. In this state, cats can get all the rest they require, but are still alert enough to awaken suddenly - they will position their body so that they can spring up and into action at a moment’s notice. You can tell when a cat is in this light cat-napping phase because their ears will twitch and rotate toward interesting noises and their eyes will be not be fully shut. Even when they are sitting upright, cats can slip into this dozing mode! The remaining quarter of our pets sleeping hours is spent in deep sleep – a state which is crucial for the body’s ability to regenerate itself and stay healthy. This phase usually lasts for shorter cycles of about ten to fifteen minutes at a time, however older cats might spend as much as thirty or forty percent of their rest time at this level. During this more profound sleep state, cats experience rapid eye movement. This usually lasts about five minutes, after which they go right back to snoozing. This dozing-deep sleep pattern goes on until the feline wakes up. When cats are in deep sleep they are typically curled up with their eyes tightly closed – they may even have their tail covering eyes, like a fluffy sleep mask. It is also the time when your kitty dreams. If you have seen your cat’s paws or whiskers twitching whilst they sleep, there’s a good chance they are dreaming! Remember - Although cats do sleep for most of the day, if you notice a change in your cat’s sleep pattern, be sure to talk to your vet. If your pet isn’t sleeping as much as normal or is engaging in an excessive amount of sleep, there could potentially be an underlying medical problem.